Juicytox Premium Cleanse – Review! Juicing is a really popular trend, loved amongst celebs and us mere mortals. The aim? To rid the body of toxins whilst losing a few pounds in the process. I’ve previously tried to DIY it with my smoothie maker, but sadly never had the willpower to see it through. (Because, lets be honest, I love food too much). 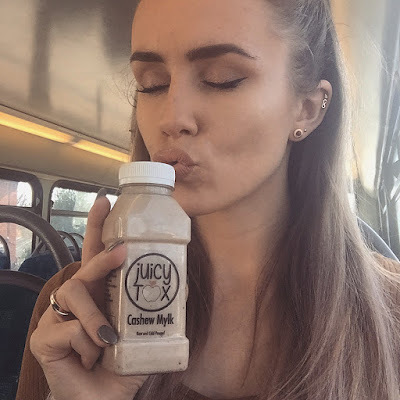 There are several companies on the market offering juice cleanses; one of these being Juicytox – who’s cleanses I’ve been eyeing up for a while I might add. – Improving the body’s natural energy levels – yes that means no caffeine! So I’ll start with my thoughts on the juices and then I’ll get into the nitty-gritty of how my feelings and mood changed over the last four days. Ginger Shot – Obviously having been at university for the last three years, I’m used to shotting ominous looking liquids *cough cough Ocean Wednesdays* so in comparison, this really wasn’t that bad at all! It’s got a really sharp aftertaste that might make you wanna stick your head under the kitchen tap, but I promise it’ll wake you up. I actually weirdly liked it as it made me feel like I was being really healthy! Drop Veg Gorgeous – (Cucumber, Celery, Pear, Pineapple, Lime, Spinach, Kale) This one was a bit of an acquired taste to be honest. Like the name suggests, it very much tasted of vegetables, which was not my idea of fun at 8.30am on day one of the cleanse, however I’ve actually really grown to enjoy this juice! The lime and pear definitely take the edge off and I’m also pleased at how smooth these juices are. Yay for no pulp! 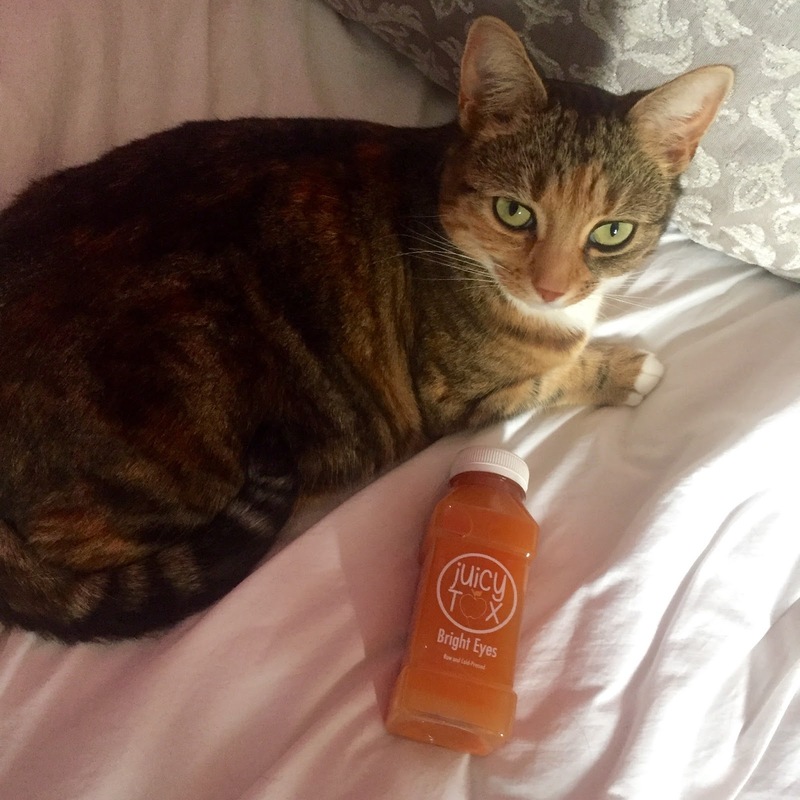 Bright Eyes – (Carrot, Apple, Orange, Lemon, Ginger) After seeing carrot listed as the first ingredient, I have to say I wasn’t particularly enamoured by the thought of this one, but I was extremely pleasantly surprised! The citrus flavours add a lovely sweetness and the ginger gives it a really nice kick. 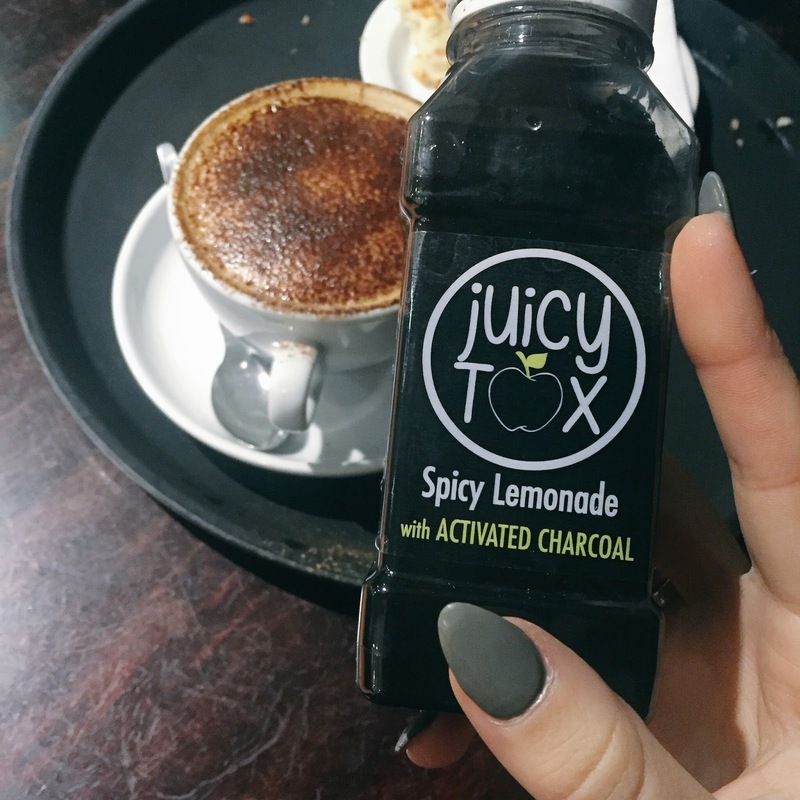 Spicy Lemonade with Activated Charcoal – (Water, Lemon, Lime, Agave Nectar, Cayenne Pepper, Activated Charcoal) I was pleased to see that Rob (Aka Mr Juicytox) had worked charcoal into the cleanse, as it has tonnes of health benefits. (I did the Blac Cleanse back in December, click here to read) Anywaythis lemonade is so delicious. If you love old fashioned, non-fizzy lemonades, (like those by Minute Maid or Snapple, then this is right up your street. I let my friend Megan taste test this on Day 1, and despite being put off by the colour; she LOVED it too! Cashew Mylk – (Cashews, Water, Dates, Vanilla, Sea Salt, Cinammon, Agave Nectar) OH my goodness this was sooooo delicious. I’m gutted this isn’t sold in stores (as is my friend Jess at work who wanted to buy just this one after trying it!) The tiny cashew pieces kind of reminded me of an Oreo milkshake, but the cinammon and vanilla made it taste so much fresher and healthier. I literally want to buy this one juice in bulk! Love love love! Pukka Teas – (Detox, Cleanse, Night) I’m very much a tea and coffee binge drinker so the thought of no caffeine for 4 days scared me quite frankly. I was also informed I might suffer from mild headaches due to caffeine withdrawals. Luckily in my delivery on Tuesday I was very relieved to see some Pukka herbal (non-caffienated) teas, cause I couldn’t cope without hot drinks in my life! Ok so FYI, saying “Close your eyes and pretend it’s Starbucks” to yourself doesn’t work when drinking these, but actually they weren’t bad at all, and kind of settled my stomach in the mornings! 1pm: My friend Megan and I had a plan to try Zizzi’s new Vegan pizza today, but sadly juice cleanse definitely equals no pizza. We ended up going for coffee instead, and to be honest, I didn’t feel too jealous cause my Spicy Lemonade was super tasty! 4pm: Ok tiredness and headache has definitely kicked in, which Rob did warn me about. I am 100% missing caffeine but not food so far. Give me a couple of hours and I’m sure I’ll be grumbling. 7pm: Yep, watching my parents eat a full roast dinner whilst I drink juice is NOT fun. Time to admit I am missing food, although I’m not actually hungry? 7pm: My headaches are gone thank goodness and I did feel quite light headed at work today, but I was running around an awful lot – not something you’re advised to do whilst on the cleanse. Had one EXTREMELY loud stomach rumble today, before realising I was 45 mins late on a juice! Not tired or groggy this evening but definitely looking forward to my PJs. 4pm: Can’t believe how well my body is functioning without caffeine! I mean I’m not about to stop drinking copious amounts of tea or anything, but I’m definitely going to try laying off the sugary Starbucks coffees. It’s nice not feeling sluggish by this time in the afternoon. I’ve been working 12-8pm today too and I’ve had loads of energy all day! 7pm: Sitting down with my last Cashew Mylk and drinking it as slowly as possible cause it’s so yummy. This is one thing I wish I could make at home, it’s like pudding! Really enjoying drinking non-caffeinated teas more too. The Pukka Detox tea nicely fills the gap normally taken by my Yogitea and I love that I’m not reliant on something to keep me awake. – Firstly, I lost 6 LBS!!!! I’m planning on slowly introducing food back into my diet so that I don’t put it back on. 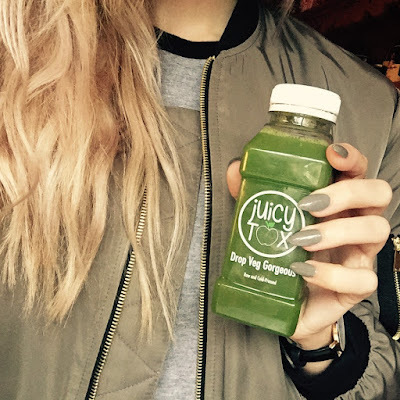 – One of the things that puts Juicytox above other companies in my opinion, is that the four days worth of juices are spread over two deliveries to ensure freshness and to maximise the benefits. – Rob, the front man of the company, is the loveliest guy, and is always checking in to offer moral support and answer questions throughout; he definitely makes the whole process easier. – Really loved the variety of this cleanse, I never got bored cause there were so many different juices. – Obviously everything is completely Vegan too, which is fab as that is something I’m aiming towards. – My skin definitely looks a lot brighter, which is probably down to the gallons of water I’ve been drinking, as well as all the goodness in the juices. 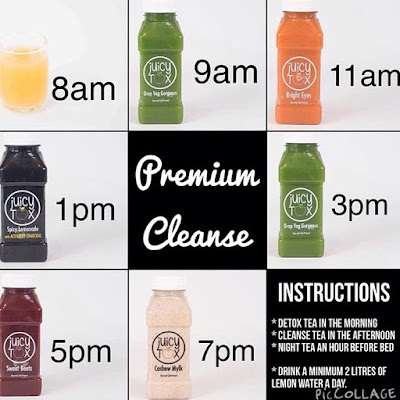 – The Premium Cleanse is available nationwide for £89.99, and £79.99 for certain areas within Sussex, which I actually don’t think is bad at all for all the goodness you’re doing to your body. It’s nice to treat yourself every now and then. Overall, I really have loved doing the cleanse. The first couple of days were pretty tough, but I felt amazing by the end. 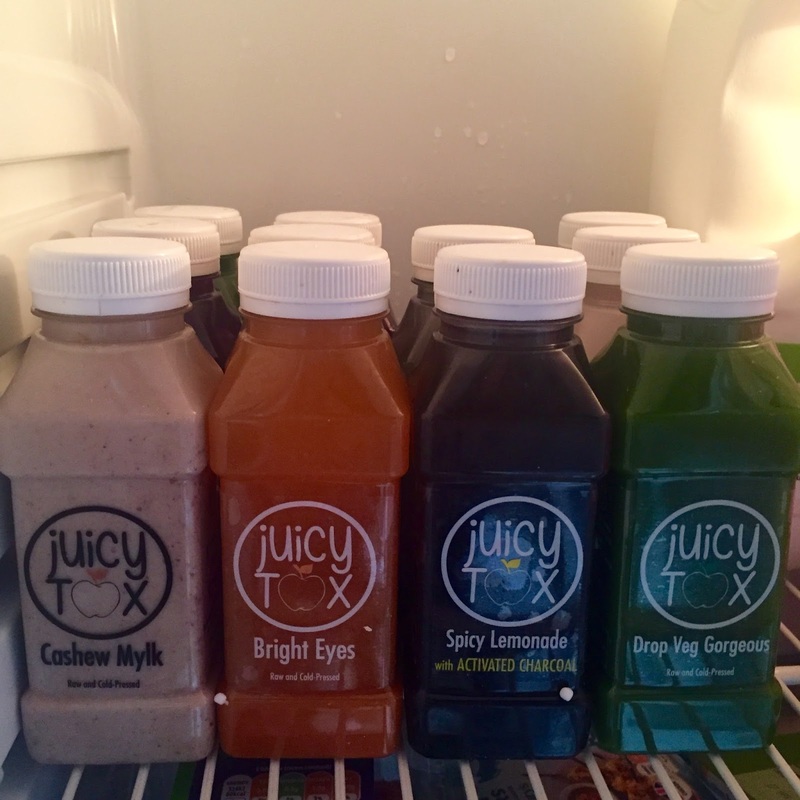 If you’re looking to shift a bit of weight in time for an event or holiday, or you just want to detox and boost your system then I really recommend you try Juicytox.